The choice is really quite simple! A 99 non running Road King or a Running Road Star for the same money with less miles.So much for resale value. As much as I enjoy wrenching on things....I'd much rather spend the time riding. A no-brainer for those having not ingested the Kool-Aid. ...you'd have a nice door-stop ! Better chance of having a spare frame than an engine. I'll bet his phone is ringing non-stop !! Might have been a deal if it wasn’t an early twin cam. It’s never good when they quit running. I wonder what his best offer was? Maybe he came to his senses and traded for a running Road Star. 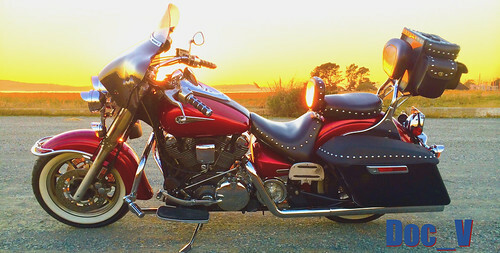 If I had money to blow, I would buy the Road King and plop a 120ci Ultima motor in it. If money was tight, the Road Star for sure. OK WELL i was much younger when i joined the old RSC , now im a 63 year old bike enthusiASSt. I used to have that, I need a harley feeling, but after having a small fleet(3) RS,s, and selling one 2 my brother ( when he was ready for a 800 pound bike, after borrowing it on and off for a few years and practicing. ), I would not want anything but a RS. And like anywhere else, and living in the shadow of daytona condos, there is tremendous pressure to be an "american" bike owner. RS's have it all, good lookin bike, yamaha reliability, plenty of power. Lifes too short to not be riding. RS till I die, i still have about 15 or 20 years , but i may need to down size to a suzuki van van when i get really old. check this out for a pit bike, does yamaha make one? No one knows how much time they have, I cheated death twice in my life, how much time do I have? Here today gone tomorrow is my mantra now.